Thursday Moda #93: Mommy+Mini Matching Christmas Looks, in Red and in Green. Today I am sharing two Matching Mommy+Mini Looks. You all know I love matching with my Vivian as often as I get a chance too. Well these two casual looks (worn and photographed about 6 weeks apart from each other) are great put-together casual options to wear on Christmas day. The first photo with our Matching Red Buffalo Check Button-Down Shirts was actually taken today on December 13th (at around 1.30 PM to be exact) and those were the cozy, warm outfits we wore today - so Christmasy right!? Oh, and look at those 5+ inches of snow on the ground. While the second outfits with our Matching Green+Orange Geometric-Patterned LuLaRoe Leggings is from when it was warmer out in early November and notice how much my hair has grown in just 6 weeks. I actually chopped off 3 inches again in early October and fast-forward 12 weeks later and my hair has grown much longer again. I definitely think I want to grow it out, now. But yeah about today's outfits, they feature pieces I have remixed a lot this year like the geometric-patterned leggings, blush pink chenille cardigan, leopard smoking flats, red buffalo print shirt and black faux leather skinny pants. THE RED CASUAL CHRISTMAS OUTFITS. These matching outfits were worn yesterday and this is the amount of snow accumulated in our front porch. We wore these home minus the top layers and wore the layering (my cardigan and Vivi's vest) as well as the beanies the few moments we were outside. It was around 1.30 PM yesterday when these photos were taken and snow was falling hard. In some areas there were 5-6 inches on the ground. The temps were about 18 degrees but due to the wind in combination with the snow, it felt about 2 degrees. We were outside for a maximum of 5 minutes because it was way too cold, that is why there are no more pictures. These are all we were able to shoot without dying from the cold lol. And the pics from this shoot are not the best as the snow was doing its own effects on a lot of the photos. Vivian was freezing so much and as much as she loves snow, she wanted to come back inside maybe a minute after we got out. I should say we wore a version of these outfits (black faux leather skinny pants and our matchy red+black plaid shirts) a few weeks ago too, when we took Vivian's picture with Santa at the mall. Unfortunately I think all of those photos are lost since they were taken with my previous cell-phone which is broken now. But I love how Vivian's outfit is the same formula as mine - skinny pants, red plaid shirt+black skinny pants with a third layer over them and pom pom beanies - yet it looks a little different and not quite the same as my outfit. Vivian didn't want to be outside for longer than 2 minutes and I cannot blame her. 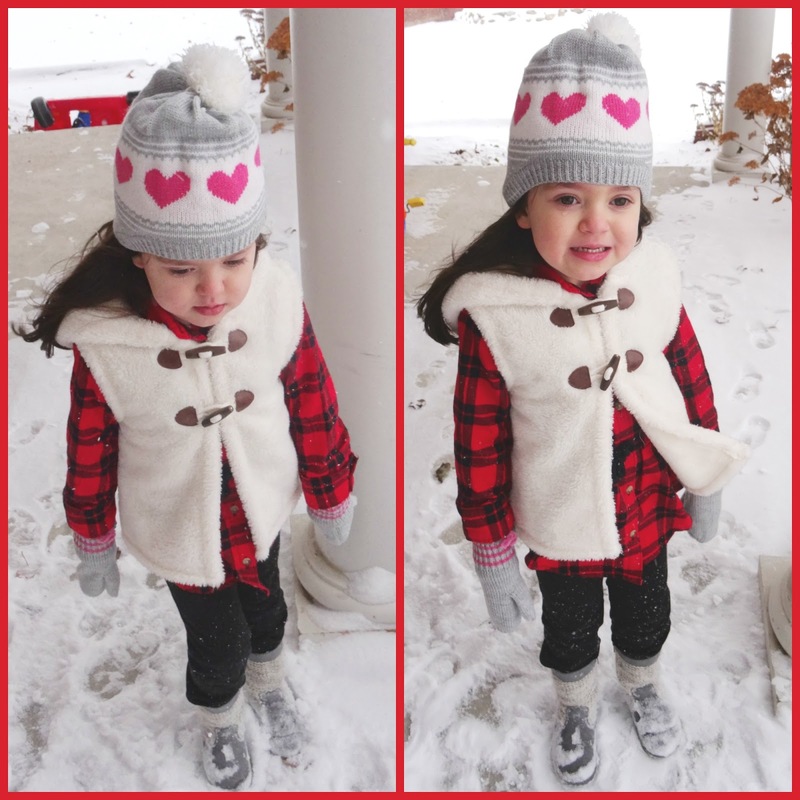 She is such a cutie but man she was so cold - she gets cold easy like mommy and daddy lol. I love her outfit so much and want it in my size. Black, red, grey and cream are perfect together for the Winter time. I love that the grey boots matched her mittens+beanie set and that fuzzy bear toggle vest is just adorable. I also love how Vivian's outfit is matching mine yet it is not the same. Red+Black Buffalo Print Button-Down Shirt: Genuine Kids via Target (New). Black Ponte Skinny Pants: Kohl's. Grey+Pink Patterned Beanie+Mittens Set: Carter's (New). Grey Faux Suede+Woven Knit Boots: Genuine Kids via Target (Gifted). THE GREEN CASUAL CHRISTMAS OUTFITS. I wore these leggings on the blog just a few days ago and you might remember them from a few weeks ago too with my Dark Olive Green Chenille Cardigan and Olive Laceup Sandals, where once again Vivian matched mama in her own identical Geometric-Patterned Leggings here. Well, we did it again. Vivian and I wore these LuLaRoe Leggings for the 10th time or so this year. These are our only LuLaRoe Leggings but boy they are so cute, in the most comfy soft material and they wash so well. 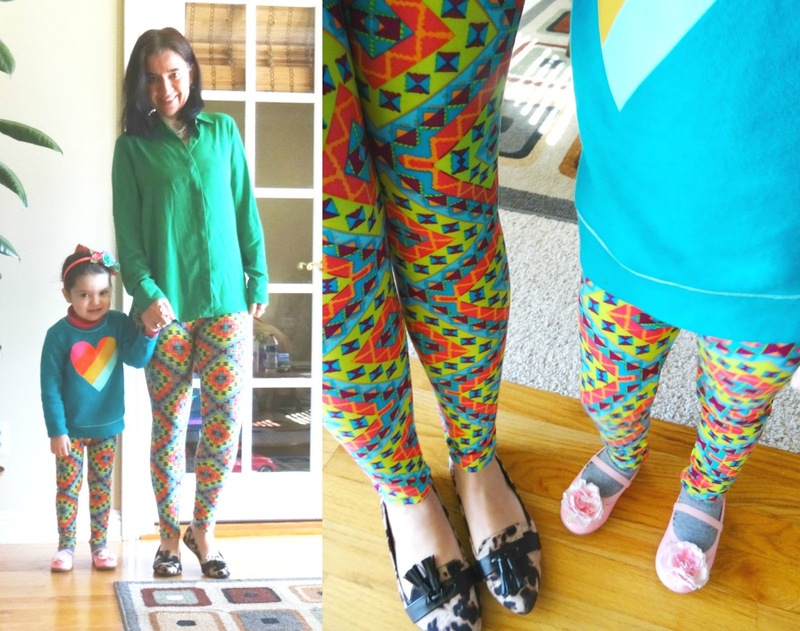 We definitely want more matchy LuLaRoe Leggings. I wore mine with a Kelly Green Chiffon Button-Down Blouse (long enough to cover the bootie lol) and pattern-mixed with my Leopard Tassel Loafers which I love. I also dressed them up with a Layered Silver Crystal Necklace. Vivian wore hers with her Rainbow Heart Graphic Sweatshirt as well as her Pink Rose Ballet Flats matched with her Rosette Headband - cutie no?! I think bright greens (and any kind of green actually) are great to wear around the Holidays. Last week you all loved my Christmas Home Tour post and I owe you part 2 of the Home Tour (hopefully I can post that on Sunday). You all loved how I decorated my beautiful home. So many of you linked festive, cheerful Holiday Looks. I saw a lot of red, green, gold and silver (look at the favorites below). 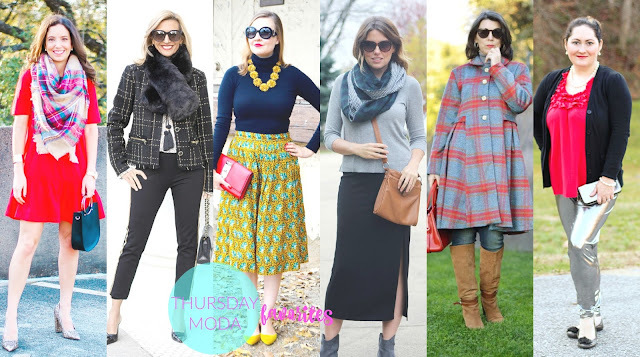 Over 100 posts were linked and among a sea of cute Holiday-inspired outfits I had such a hard time choosing favorites but I did so with the following 6 looks - a couple of new faces to this Thursday Moda feature. I see all of these outfits as perfect looks for December. Some are dressy for a holiday event like an office party, some for everyday casual comfort like that gorgeous plaid coat and some perfect to travel in warmer climates. Kim's 'Holiday Style' involves a red fit+flare dress, the infamous but so-pretty colorful blanket scarf and glittery gold pumps which I love. Nora is 'Holiday Chic in Black' with classic, modern, sophisticated pieces she designed herself. That is one way to dress up black head to toe. The fur neck-wrap piece is gorgeous. Katie's got 'Goodies at Her Doorstep' and goodies in her outfit with all the rich, extremely-beautiful mustard color she is wearing from head to toe. The shoes (the icing on the cake by far), the skirt, the necklace - all of it is stunning and so perfect for the Holidays. Rose styles an 'Everyday Maxi' (she found on sale) with a sweater and blanket scarf on top. I think this outfit is so chic, comfortable and warm to travel in if you are going somewhere warm. Suzy's flared-out coat has 'A Vintage Twist' to it. The brick color with the muted blue is so pretty. Della is in full 'Christmas Party Sparkle'. We all know I love red and her metallic foil pants are so fun and perfect for this month. Great outfit to ring in the New Year.